For updated information on our activities, please see the Home page. From an initial membership of 30 (in 1966), the Augusta Bird Club has grown to over 100 members today. Our members enthusiastically participate in a wide variety of ornithological activities and nature-related activities, both local and statewide. Many of our members have served or are serving on the board of the Virginia Society of Ornithology. The club last hosted the annual meeting of the Virginia Society of Ornithology (VSO) in May 2000. As an organization, we are strong supporters of many wildlife conservation causes related to our interest in birds. We regularly go on field trips in the local area, hold monthly meetings which feature a speaker on bird or nature-related matters, gather to relax and chat at club social hours, and collaborate with a variety of bird counts. Meetings are held at 7:00 PM on the second Monday of the month, September through April, with occasional exceptions. Each month features a special program given by prominent bird experts, wildlife photographers, conservationists, and others. The regular meeting place is the Covenant Presbyterian Church, on North Coalter Street in Staunton. Field trip to Bell's Lane, November 16, 2017. Throughout the year -- depending on the weather -- we organize field trips to look for birds, for the sheer enjoyment of it. Most destinations are within Augusta County, but we sometimes go to other parts of Virginia, and on rare occasions to other states or countries. In addition, the Augusta Bird Club participates in several different statewide or nationwide bird count endeavors, most notably sponsoring two Christmas Bird Counts each December. Some of our members also participate in the Breeding Bird Surveys, have devoted countless hours at the Rockfish Gap Hawk Watchi each fall, and have contributed over one thousand records of 131 species in the Virginia Atlas Project (1984-1989). 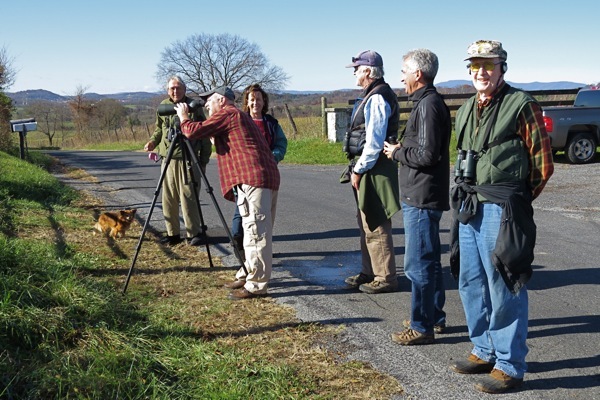 Our club also maintains extensive and well-documented records of rare and unusual bird sightings, following the guidelines established by the Virginia Avian Record Committee. These records are published approximately once per decade in Birds of Augusta County, of which YuLee Larner (1923-2013) was the sole editor of the second (1998) and third (2008) editions. (An updated edition will soon be available in electronic form as a PDF.) The Augusta County bird checklist derived from that book is a valued ornithological resource. 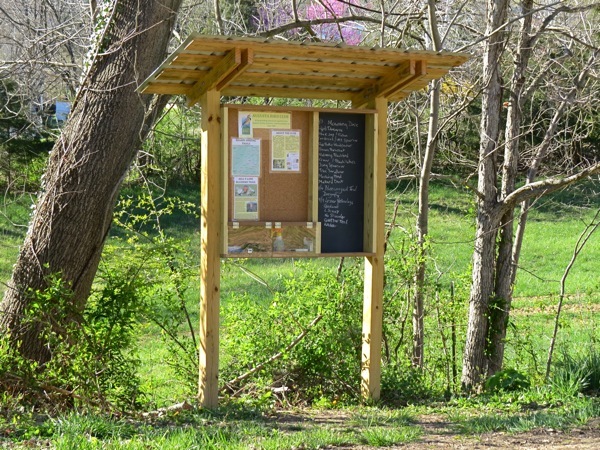 The bulletin board kiosk near the south end of Bell's Lane. The Augusta Bird Club also promotes avian education and disseminates information about wildlife conservation through regular monthly meeting programs, as well as programs to local groups, schools and organizations by club volunteers. The annual Earth Day events, Riverfest in Waynesboro, and "Kites 'n Kritters" are some examples of these. We also built and maintain an informational kiosk on Bell's Lane, one of our favorite places to look for birds. Our club annually cleans up to maintain its natural beauty. Scheduled didactic "birding classes" offered in the past have been well attended. For many years the club has sponsored area youth, enabling them to attend Nature Camp in nearby Vesuvius, Virginia. Finally, we remain very conscious of the immense efforts made by our club's founding members, including Dr. John Mehner (who passed away in 2006) (see his obituary), and YuLee Larner (1923-2013). We are indebted to the legacy they left, and are strongly committed to upholding the values and objectives which they laid out when the club was founded in 1966. For more historical information on our club, see History of Augusta Bird Club (PDF), written by Dr. Mary Vermeulen (1939-2017). Mary served for many years as Augusta Bird Club Historian, and was the author of YuLee, the biography of the beloved founding member. Scenes from various Augusta Bird Club field trips and other events from recent years, with the club's co-founding member YuLee Larner in the center. 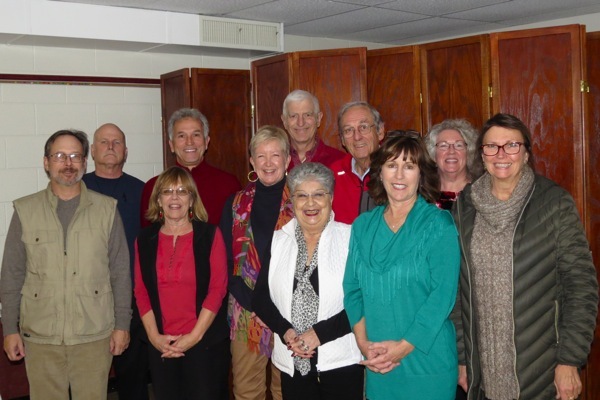 Responsibilities for various club functions are carried out by the members of the Augusta Bird Club board, who are elected once a year. They are listed on the Contacts page. Membership in the Augusta Bird Club is open to all. For more information on our activities, see the respective pages on this Web site. NOTE: E-mail addresses on this Web site are modified so as to prevent spam. Just replace the "_AT_" with the standard "@" symbol.